Moon Express, a privately funded company, is developing a robotic spacecraft to land on the moon. This story was updated on Nov. 15 at 11:16 a.m. EST. NEW YORK — When he's not acting as the CEO of Intelius, an information-services company, Naveen Jain dreams of one day being able to mine the moon. 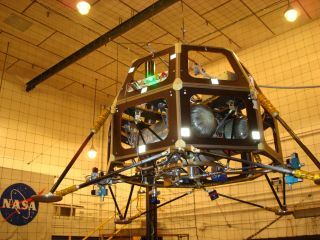 In August 2010, Jain co-founded Moon Express, a privately funded company that aims to build and launch a robotic spacecraft to the moon. The lander is being designed to carry up to 220 pounds (100 kilograms) of cargo to the lunar surface. Moon Express is one of nearly 30 teams making a run at the $30 million Google Lunar X-Prize, which is a commercial race to land a homemade robot on the moon. The company was already awarded a contract worth up to $10 million as part of NASA's Innovative Lunar Demonstration Data program. But Jain has his sights set on even loftier ambitions. From a restaurant overlooking the heart of Manhattan's bustling Times Square, Jain chatted with SPACE.com about the future of Moon Express, mining the moon, and why our planet's natural satellite elicits such fascination. SPACE.com: When did you first become interested in space exploration, and what inspired you to co-found Moon Express? Naveen Jain: Space exploration has fascinated me since I was a boy growing [up] in India. The moon in particular was a symbol of inspiration for me; iconic of opportunity for all people no matter what their economic or cultural background. When I learned more about the moon from my co-founders Bob Richards and Barney Pell, it became clear that the moon represents far more than inspiration - it has abundant resources that can benefit life on Earth and help leverage further opportunities for profitable space commercialization. SPACE.com: Moon Express has grown a lot in the past couple months. What are some of the latest developments? Jain: We're ramping up our team to meet the huge technical and business challenge of reaching and exploring the moon. Accelerating technology has enabled our entrepreneurial company to take on the complexity of a lunar mission that was only possible by governments several decades ago. Over half our staff are in their 20s, which makes sense since the average age of the engineers who designed the Apollo program was mid-twenties. We are creating a great team with a mix of experience and youth. This graphic shows how Moon Express envisions its lunar lander can be used on future missions. SPACE.com: When do you think your lunar lander could be ready? Jain: Our team has proven out many of our critical subsystems of our lunar lander systems through rapid prototyping and will be proceeding on [an] accelerated flight program to meet our goal of a late 2013 or early 2014 launch to the moon. SPACE.com: What do you envision this lander could be used for in the future — either scientifically or commercially? Jain: The lander system is modular and very flexible for adapting to a number of mission goals. We have customers interested in doing science as well as commercial activities, but we also have our own exploration interests such as seeking out the ground truth of lunar mineralogy that will guide our interests and future investments in liberating lunar resources for benefits to life on Earth and our human expansion into space. SPACE.com: You've spoken before about the possibilities of mining the moon. What sort of benefits can we gain from that? Jain: Recent probes have discovered vast amounts of volatile materials and we have compelling evidence of precious metals and materials important to Earth's energy future. Moving to space-based resources will also help protect our biosphere from resource extraction that is harmful to nature and to us. The moon has no biosphere; it is a readymade mine in the sky allowing exploitation for human benefit without harm to any indigenous life. SPACE.com: Are there legal hurdles to mining or even owning parts of the moon? Jain: Existing treaties and previous government lunar missions provide all the precedent we need [for] commercial lunar activity. You do not have to own the moon or any part of it to mine it and liberate value that becomes yours. Like fishing in international waters, private companies have a right to peaceful presence and economic activity and to own the fruits for their labor and investment. An enhanced image of the moon taken with the NOAO Mosaic CCD camera at Kitt Peak National Observatory, and superimposed on a separate image of the sky. SPACE.com: Robert Bigelow of Bigelow Aerospace recently said that the United States could lose the race to own the moon to China if there isn't a greater sense of urgency to design and build lunar bases. Do you agree that we are in the midst of a space race with China? The Apollo program was momentous but also short-lived and short-sighted. The real race is toward permanent and sustainable economic space presence that satisfy fundamental economics laws of supply and demand. The U.S. has the opportunity to use its entrepreneurial horsepower to open up the resources of space and the moon for national interests and for benefiting everyone on Earth. The moon should not become the U.S. lost continent and I totally agree with Bob Bigelow that the moon represents an opportunity for the United States to recover and maintain its global economic leadership. Moon Express and Bigelow Aerospace have a lot of common goals here. SPACE.com: Some people regard the moon as somewhere we've already explored, and they don't necessarily see the use in sending robotic vehicles or humans back. Why do you think the moon is a worthwhile destination for future exploration? SPACE.com: Why do you think people — scientists as well as the general public — are fascinated by the moon? Jain:The moon is an icon symbol of all cultures on Earth. It's the most visible object in the night sky next to the sun, so ancient mythology naturally considered the moon a vital influence on life [on] Earth. This is in fact true scientifically, as the moon controls tidal forces and many animal behaviors have evolved over millions of years based on the consistency of lunar cycles. The moon as a symbol of romance is embedded in many cultures: "Honey Moons" to celebrate bonding are a common custom throughout many cultures. We have therefore evolved to feel a personal connection the moon in many ways.